Monday April 18th 1921 A bright sunshine is taking the snow away. Fannie up in forenoon helping set tables for Shakespeare Club dinner tonight. I sat at the big table. Soon after the dinner we all went down to Fannies where The Ladies put on a little play. The Girls spared no trouble or expense to make their party a success. Letters from Lizzie Lindley and Lorie. 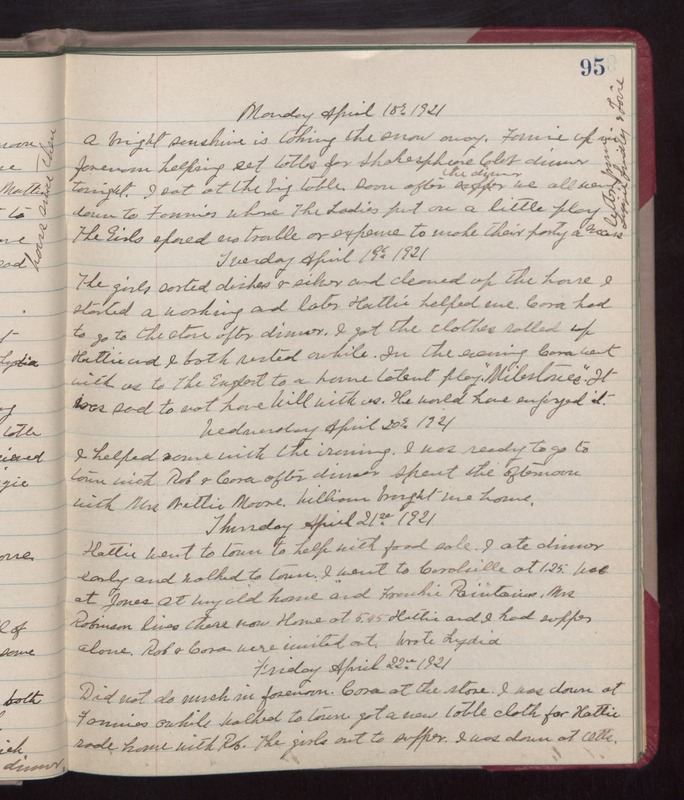 Tuesday April 19th 1921 The girls sorted dishes and silver and cleaned up the house. I started a washing and later Hattie helped me. Cora had to go to the store after dinner. I got the clothes rolled up. Hattie and I both rested awhile. In the evening Cora went with us to the Englert to a home talent play "Milestones." It was sad to not have Will with us. He would have enjoyed it. Wednesday April 20th 1921 I helped some with the ironing. I was ready to go to town with Rob & Cora after dinner. Spent the afternoon with Mrs Nettie Moore. William brought me home. Thursday April 21st 1921 Hattie went to town to help with food sale. I ate dinner early and walked to town. I went to Coralville at 1.25. Was at Jones at my old home and Franklin Pointains. Mrs Robinson lives there now. Home at 5.45. Hattie and I had supper alone. Rob & Cora were invited out. Wrote Lydia. Friday April 22nd 1921 Did not do much in forenoon. Cora at the store. I was down at Fannies awhile. Walked to town got a new table cloth for Hattie. Rode home with Rob. The girls out to supper. I was down at Otts.